President Donald Trump's Homeland Security chief, John Kelly, reportedly had tense exchanges with Arab and Latino leaders during meetings in Michigan this week. During a meeting on Monday with Arab-American and Muslim representatives in Dearborn, just outside Detroit, Nabih Ayad, a civil-rights leader and lawyer who founded Dearborn's Arab American Civil Rights League, told the Detroit Free Press that he pressed Kelly about executive orders targeting six Muslim-majority nations. Ayad also asked the DHS chief about screenings at US ports of entry, requesting Kelly's department keep logs of those questioned to see if one group was targeted disproportionately. "He stood up and walked away almost," Ayad told the Free Press. "He said, 'I'm leaving unless you decide to stop your questions and have someone else ask a question.' ... He actually got out his seat." Later in the meeting, Kelly said that "generally" every foreign and American citizen arriving in the US moves "straight through the process." But, he added, "A very tiny number are set aside for additional screening that's not based on religion or color or politics, and I reject anyone that makes that claim." A Homeland Security spokesman also told the Free Press in a statement that, "One participant in a meeting ... incessantly pressed the Secretary, incorrectly alleging that DHS officials engage in targeting and racial profiling of Arabs and religious profiling of Muslims." "Secretary Kelly reiterated that CBP and ICE officers carry out their duties professionally, humanely and in accordance with the law, noting that they do not target individuals based on race, religion or political views. When the participant insisted on ... repeating the same erroneous allegations, Secretary Kelly made his frustration known," the statement said. During another meeting that morning with Latino and Iraqi Christian leaders, Kelly was asked about the conduct of DHS employees, which includes Customs and Border Patrol and Immigration and Customs Enforcement agents. He defended their work, saying, "I'm not going to put my men down." Kelly sought to allay concerns about detainees being transferred to distant detention centers, telling attendees that those taken into custody would be sent to facilities where space was available. The Homeland Security secretary also told the meeting that his agents were only seeking undocumented immigrants with criminal records or "another negative factor," according to Susan Reed, a Michigan immigrant-rights advocate. Reed told the Free Press that her observations showed something different, with, on many occasions, people conducting the "basic business of their lives" apprehended and placed in deportation processes by DHS agents. In recent weeks, Trump's immigration crackdown has ensnared a number of people with no criminal record other than their illegal entry to the US, as well as others known to be advocates for undocumented immigrants. 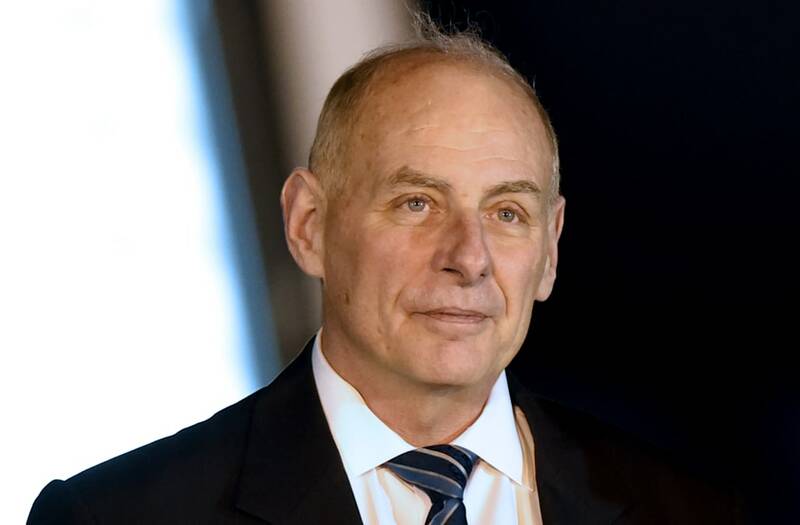 Trump has praised Kelly for his work addressing immigration (though the decline in immigrant arrivals at the southern border cannot yet be considered permanent or attributable to this administration). Reaction at home and abroad to Kelly and the immigration initiatives he has spearheaded under Trump has been less laudatory. Democratic lawmakers became frustrated with ICE and Republican leadership in February, after the agency canceled a meeting with them on February 14, and then saw Latino Democratic members excluded from the list of attendees for a bipartisan follow-up meeting later that week. Democrats and a GOP aide told The Huffington Post that ICE had picked the guest list for the second meeting, while ICE said the speaker's office had done it. Democrats expressed frustration with Kelly himself after a March meeting where they said he hadn't provided substantive responses and appeared"belligerent," "tense" and "rude," evincing a "pass the buck" attitude, according to Politico. A DHS spokesman said Kelly tried to answer as many questions as he could, though Democrats said Kelly did not have responses to dozens of letters they had sent DHS. Many in the US have come to see Kelly's actions as DHS secretary at odds with many of his stated positions prior to taking the job. South of the border, Kelly has become painted with the ire many Mexicans feel toward Trump. "They don't care for John Kelly, because ... they look at him as not having the moral courage to stand up to Trump," Mike Vigil, a former chief of international operations for the US Drug Enforcement Administration who maintains contact with Mexican law-enforcement officials, told Business Insider earlier this month.